A year ago, I used to be a really big Pinterest addict. I'm not even exaggerating. When I say addict, I mean addict. I would come home from work and literally spend the entire night pinning things, from the minute I walked in through the front door to the moment I went to bed. It was that bad. It started at work since I really, really, really hated my finance job. And armed with my own office and the knowledge that my contract was ending in a year, there really wasn't too much incentive for me to work hard — instead, it was the perfect recipe for obsessive pinning. These days, my Pinterest obsession has waned considerably. I mean, sure... although I still pin things from time to time and consider myself a somewhat active user, my usage has definitely dwindled. This is due to a variety of things: a new job in which I love and I'm motivated to work hard, a more active social life in Portland, and the fact that I'm exercising more. But truthfully, it isn't just those factors that has led me to pin less things. Because the fact of the matter is that when I do go on Pinterest these days, I don't really find anything appealing to pin anymore. Did I just break some unspoken rule just then? Was I not supposed to say that? Either way, sometime during the last year, the quality of Pinterest's content has regressed considerably, especially in the Food & Drink section. It seems that there are some recipes out there that are solely meant to appeal to, uh, the "Pinterest crowd". You know the kinds of recipes that combine three or more different flavors together? Things like "Caramelized Banana Chocolate Nut Loaf with Browned-Butter Coffee Mocha Glaze", "Chocolate Chip Cookie Dough Stuffed Red Velvet Cookies with White Chocolate Chips" or "Maple Bacon Sea Salt Brownies with Habanero Bourbon Glaze". I'm not making this up! When I see those pins, it's just like... whoa there... slow your roll! Just because you throw five different flavors — no, wait, trends — together in one recipe, doesn't mean it's actually any good... whatever happened to that whole Alice Waters and Mark Bittman philosophy where real, good food is simple? 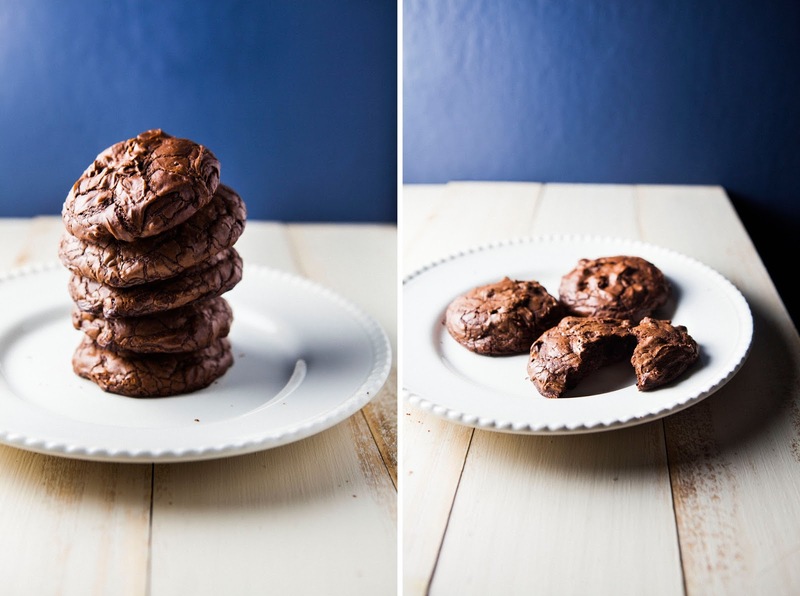 I'm not gonna lie — I was first introduced to the concept of brownie cookies through Pinterest a few months ago. But instead of cringing through a really long list of flavors in the recipe title, I was actually intrigued. 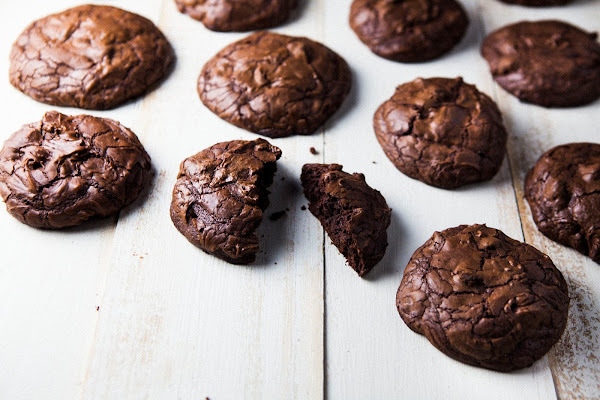 Because brownie cookies! Didn't that sound like a great idea? It was two of my favorite pastries together as one, neatly combined in a delightful package. And so how did the combination work, in real life? Well, when the cookies first came out of the oven, I took a bite. It was delicious and very chocolatey, yes, but I initially thought I'd screwed something up in the recipe — too much liquid, maybe, because the cookies tasted more like chocolate cake than chocolate brownies. Too light and fluffy in the center, definitely more cake-like as opposed to having the dense, chewy texture I often adored in brownies. But as the cookies cooled overnight, something magical happened. The next day, when I took a bite, there it was. The brownie texture that had first eluded me, this time complete with a cracked, chocolate top — all wrapped up in the convenience of a neat cookie. So maybe there's something to be said about all those over-the-top recipes found on Pinterest. And okay, while a brownie cookie isn't the most out-there combination I could have made, I could maaaybbeee see the appeal to something like a "Nutella and Salted Caramel Stuffed Double Chocolate Cookies with Sea Salt". I mean... I like all those flavors and ingredients individually, so why wouldn't I like them all together... right? This recipe, based on a recipe for cookies from Seattle's famous Dahlia Bakery, makes a LOT of cookies. I decided on a whim to make these at 8PM, and was ended up scooping the last of the cookie dough into balls for baking at around 11PM. If you don't want that many cookies (I estimated I had around 60 or so), cut the recipe in half. The cookie's chocolate flavor intensifies over time. When you first pull them out of the oven, they taste like chocolate cake, but left to cool completely, they turn into brownies. They're best when cooled for 3 to 5 hours, or even overnight. If you're making the cookies ahead of time, do NOT refrigerate the dough — instead, please keep it covered at room temperature. Chilling the dough will make the cookies incredibly hard to scoop, and the cookies will not spread and crack properly if the dough is chilled first. Preheat the oven to 350 (F). 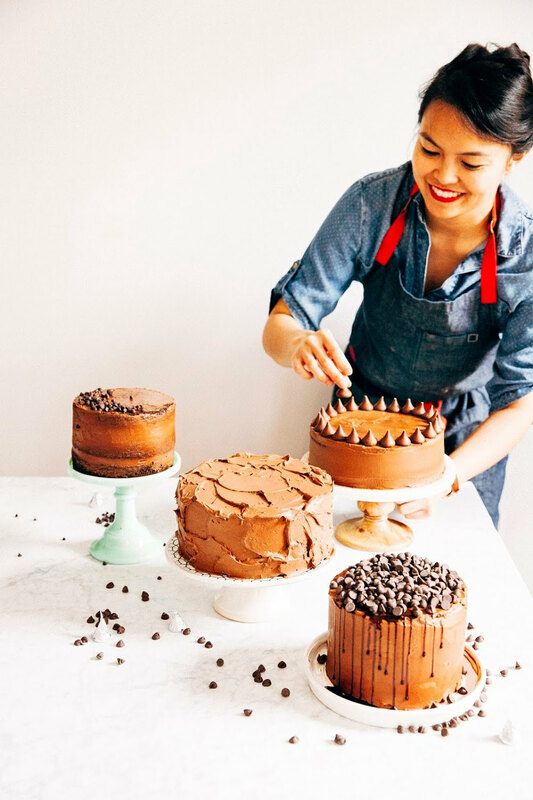 In a medium bowl, whisk together 1 1/4 cups all-purpose flour, 3 tablespoons plus 1 teaspoon unsweetened cocoa powder, 1/2 teaspoon baking powder and 1/2 teaspoon kosher salt. Set aside. Place 1 pound plus 4 ounces finely chopped bittersweet chocolate in a double boiler (or, in a heatrpoof bowl over a saucepan of very hot water, with the bottom of the bowl NOT touching the water), using a rubber spatula to stir occasionally until the chocolate is melted and smooth. Once the chocolate is completely melted, remove heat and allow to cool for 5 to 10 minutes. In the bowl of a freestanding electric mixer fitted with a paddle attachment, combine 1/2 cup plus 2 tablespoons unsalted butter and 2 1/4 cups granulated sugar. Beat together on medium-high speed until well combined and the mixture has turned light and fluffy, around 5 minutes. Once the mixture is light and fluffy, slow the mixer to its lowest setting and add 6 eggs, one at a time, only adding the next egg until the previous egg before it has been fully incorporated into the batter. Once all the eggs have been added, scrape down the sides of the bowl with a rubber spatula. Increase the mixer speed to medium-high and beat for another 2 to 3 minutes, or until the mixture is very light, creamy, and pale in color. Once the mixture is very light and creamy, add the melted chocolate (from the 3rd step) and 1 tablespoon vanilla extract and mix until just combined. Remove the bowl from the mixer and sprinkle the flour mixture (from the 2nd step) over the mixture, before folding them in using a rubber spatula. BE CAREFUL NOT TO OVERWORK THE BATTER AFTER YOU ADD FLOUR, or your cookies will be tough and I will cry for you. Simply fold until the dry ingredients have just been incorporated — it's okay to have one or two flour streaks left. Once the flour mixture has been incorporated, fold in 1 1/2 cups bittersweet chocolate chips and 1/2 cup mini chocolate chips. 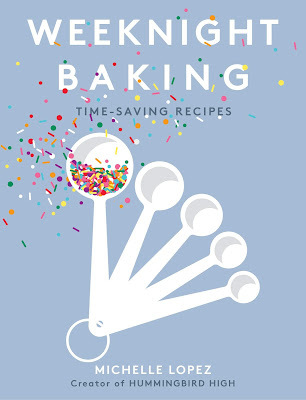 Start scooping the cookies as soon as you finish making the batter. The batter is very soft at first, but it starts firming up quickly as it sits, which makes it more difficult to portion. I used about 2 tablespoons of cookie dough (measured out by a 1-tablespoon cookie scoop) for each cookie. Scoop each portion onto parchment- or Silpat- lined baking sheets, placing them about 2 inches apart. Bake the cookies in the preheated oven until they are evenly cracked all over the tops and softly set, about 14 to 16 minutes. Remove the pans from the oven and cool on a wire rack. Allow the cookies to cool completely before removing them from the baking sheets with a metal spatula. It's sad to say, but I feel like what happened to Pinterest is a lot like what happened to Yelp. What was once a trusted source of information curated by people who have a genuine interest in food was overtaken by the sad food reality that is America. I mean, the #1 reviewed restaurant in my hometown is Texas Roadhouse...seriously? Might as well be Olive Garden. Anyway, all rants aside, glad you were able to find a delicious needle in the haystack! I LOVE Dahlia in Seattle and had no idea they had a cookbook. Definitely going to check it out! 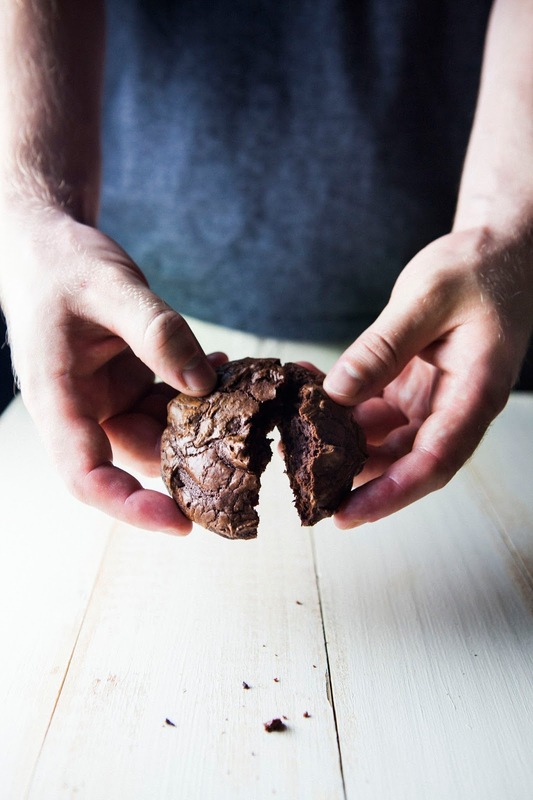 Sounds like the best of both worlds, the easy convenience of picking up and holding a cookie but with all the richness of a brownie! I love the idea of combining two favorites in one delicious sweet treat. I will definitely have to try this recipe! I love the last photo where the middle stack of cookies is in the focus but the rest is not. How did you do this? Cookies sound good. I put my camera to a low f/stop and focused on the center stack! 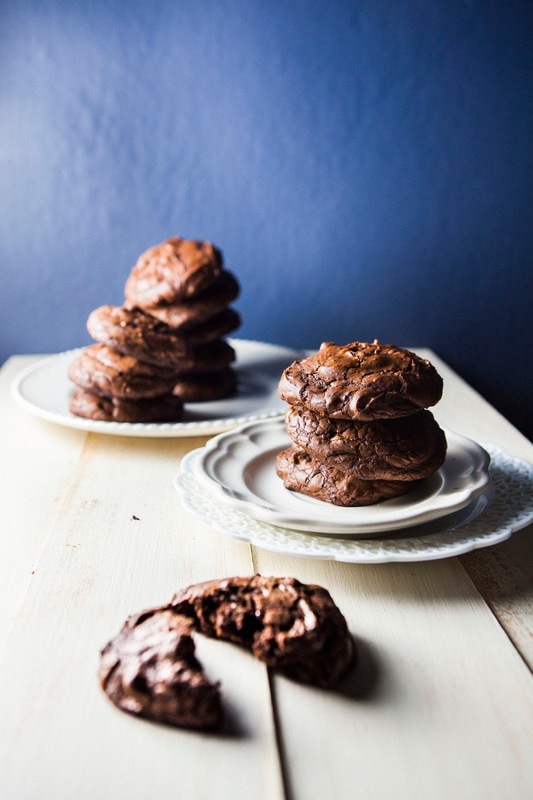 These brownie cookies just made me smile a huge happy smile! We were looking for a great recipe for my son to use to test his hypothesis cookie crunchiness for his science fair project. We're going to enjoy making this Brownie Cookie recipe over and over again to get his data charted. Thanks for sharing!